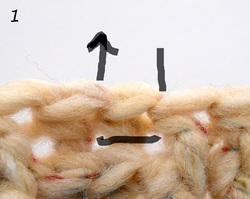 NOTE: Post stitches are worked under the top loops of a stitch, and around its post -- the vertical part of the stitch. 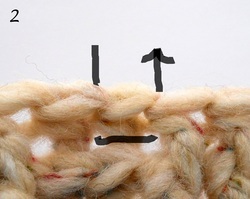 (1) Yarn over, insert hook back to front to back around the post of designated stitch, and yarn over. (2) Pull loop around the post to the back again. (Three loops on hook.) Yarn over and pull through two loops, yarn over again and pull through remaining two loops.